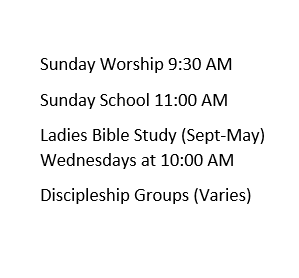 Compared to most larger churches, our worship service could be described as simple. The worship team consists of 2-3 singers, a piano, and some stringed instruments. We use a blended style of worship songs, ranging from recent contemporary songs that you hear on K-Love or The Fish to traditional hymns sung in beautiful 4-part harmony. The worship service consists of singing together, sharing of tithes and offerings, inspirational preaching from the Word of God, and an opportunity for those present to share praise reports, words of encouragement, and/or prayer requests followed by a time of prayer. You are invited to join us any Sunday morning. All ages welcome to worship together with us.